In 1952 John Steinbeck wrote in East of Eden: "The greatest terror a child can have is that he is not loved, and rejection is the hell he fears. I think everyone in the world to a large or small extent has felt rejection. And with rejection comes anger, and with anger some kind of crime in revenge for the rejection, and with the crime guilt--and there is the story of mankind." 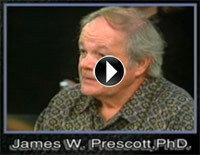 Dr. Prescott's pioneering research found here explains the Origins of Love & Violence, dramatically, clearly. It is an honor to have his work represented here as part of Touch the Future.